Didn’t mean to disappear for the week. Just busy with life stuff and starting to panic (more) about the upcoming quilt show. 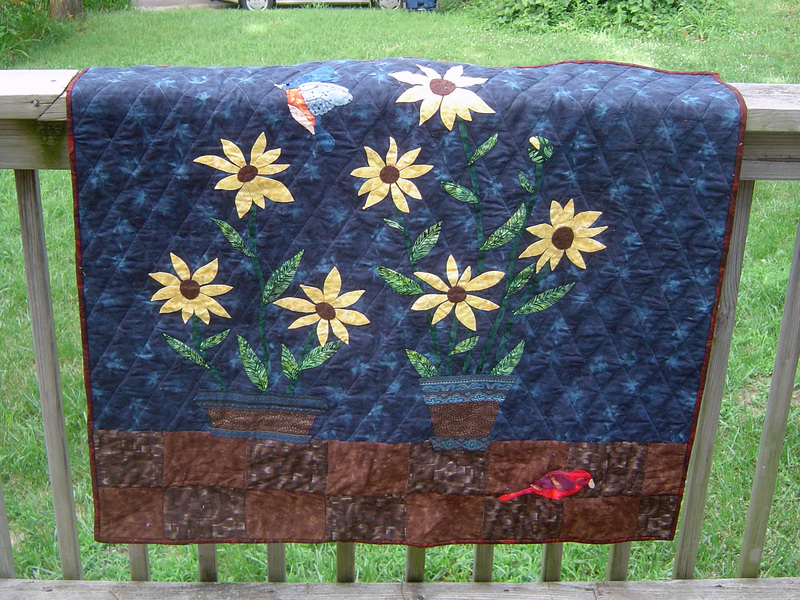 I took my finished (minus some of the beading) Sunflower Patio Dreams quilt to work this week to show it off. Here’s the red bird with his eye. To which I said thanks. And then I said that I worked on it a little bit at a time after lunch sewed down 2 petals or so every day. So persistence won out. I also said that I started it in September of 2009, and took a several month break from it several times. And I said that I still wanted to put beads on the sunflower centers. 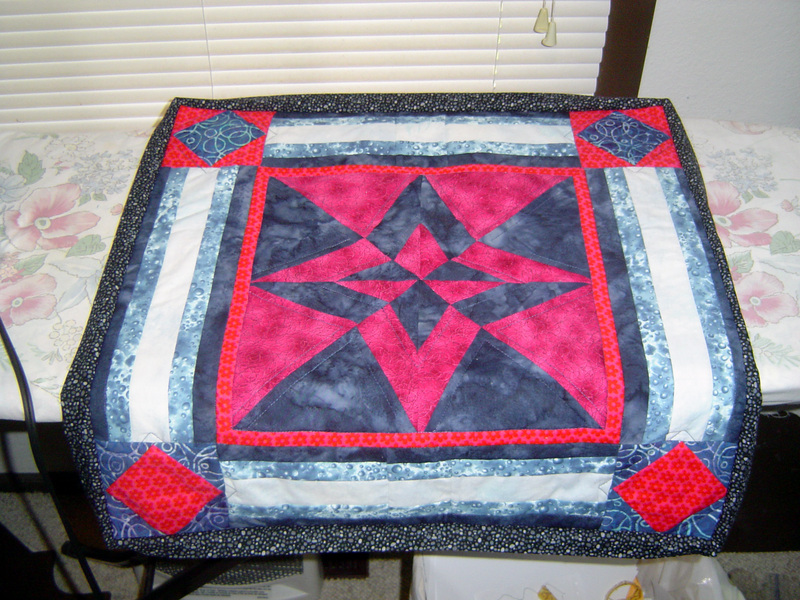 I have also pretty much finished my silent auction quilt with the exception of the binding. And the entire mini sleeve. Haven’t decided on the name. Something about early morning colors, but bright eye crushing pink just doesn’t describe the morning light in a positive way as scarlet or crimson. 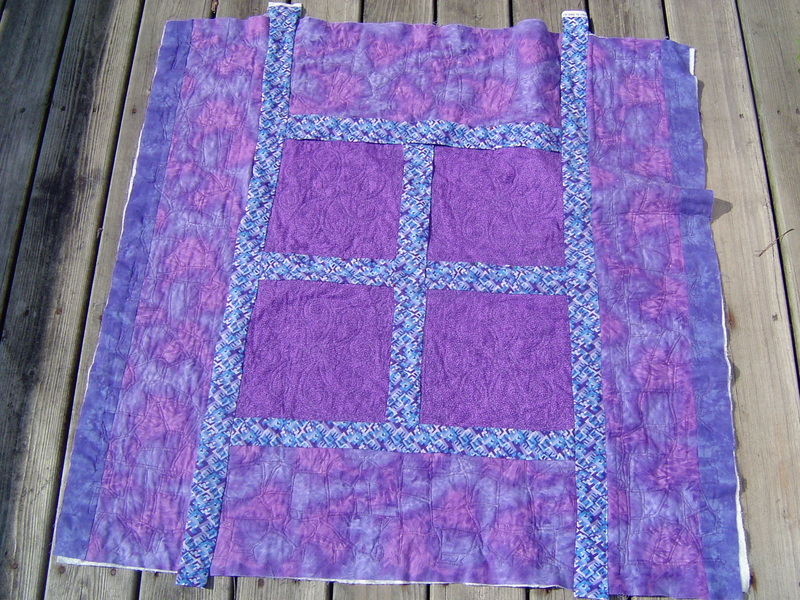 Also have the borders quilted very very lightly. 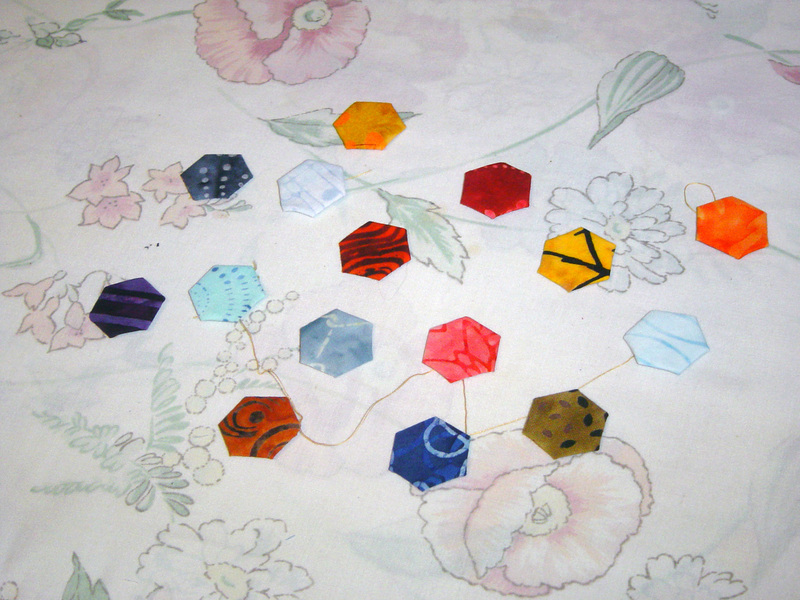 Which I may remedy with my own design on the borders that I made up for another quilt. 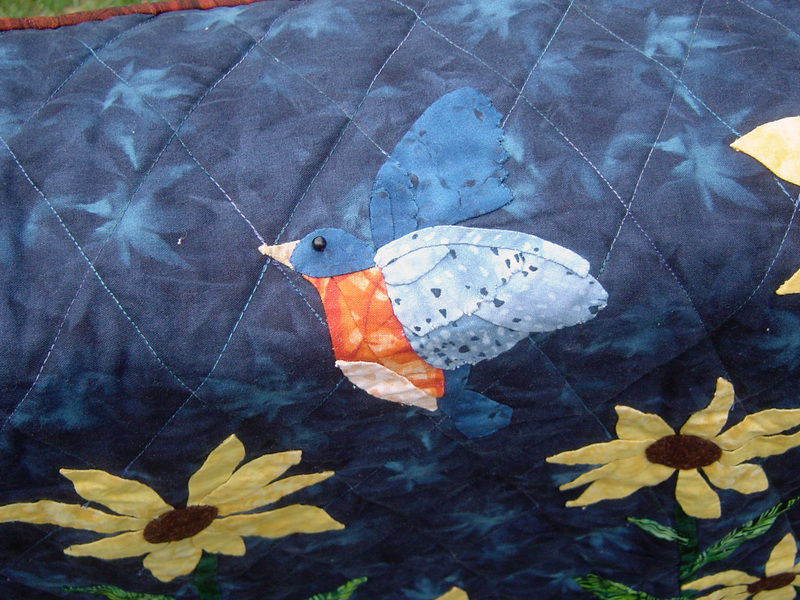 But my FMQ isn’t all that great yet and I may run out of time. We’ll see how it goes. 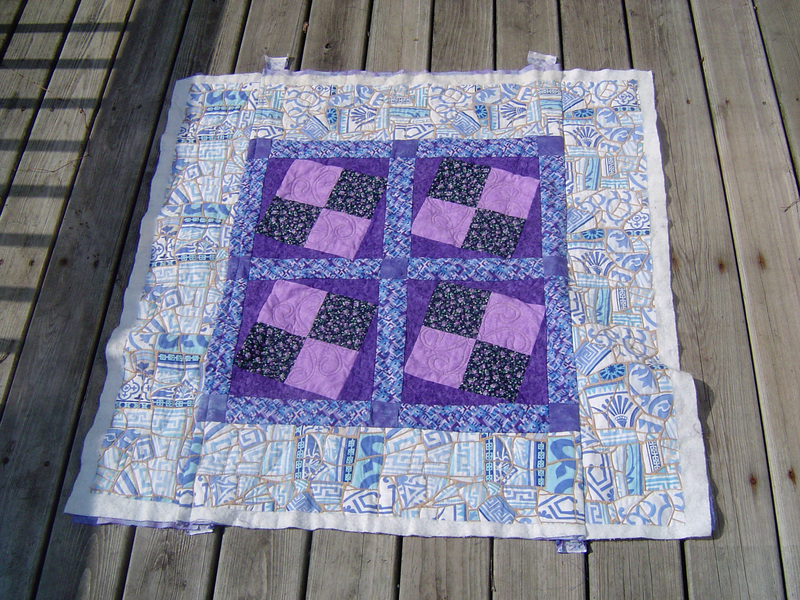 Also getting some thoughts on how to make my purple tilted four patch quilt as you go quilt better. I think I’ll take a cue from the book I’m borrowing from a friend called, Quilter’s Playtime, and introduce some interrupting strips to make the quilt more artsy. 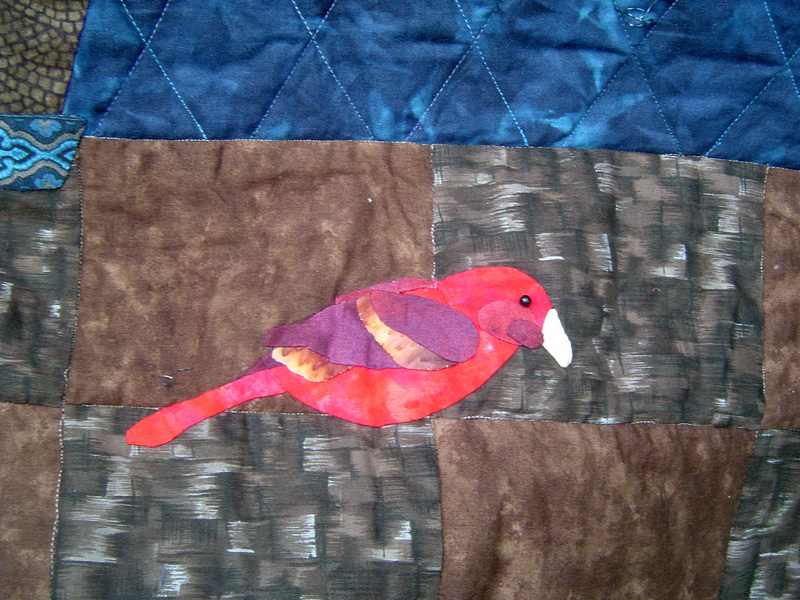 Still have a few seams to hand sew down on the back, but then I want to add more applique. Here’s the quilt as it stands. 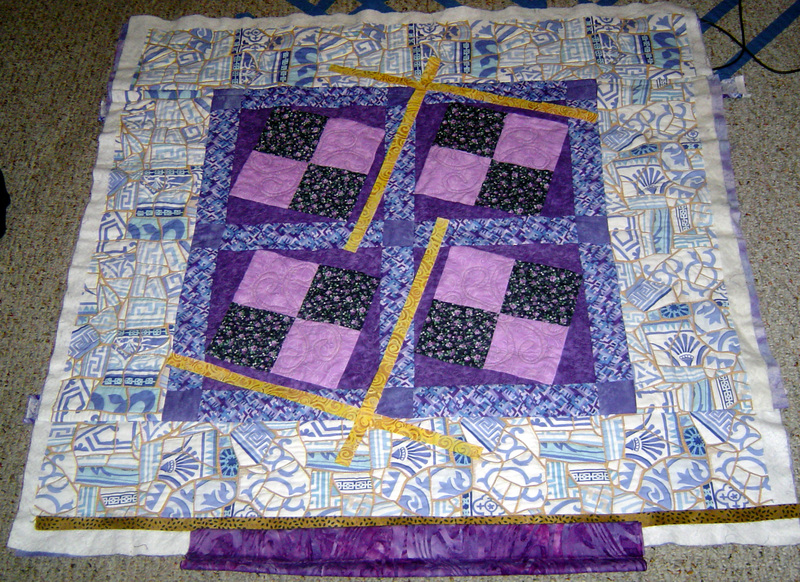 This quilit is definatley not going to win any piecing awards or any free motion quilting awards (some slight tension issues in the middle), but I still may put it into the show. Yellow applique strips that cut into all that sashing, and is parallel to the tilt of the blocks. With a dark gold kicker around the binding and dark purple binding to bring the dark back into the outside. I may also do (just thinking right now), some little prairie point folded corners in the corners of the binding that mirror the tilt of the blocks. Not sure how I am going to do this yet, but it may be worth tying the gold back out on the outside. 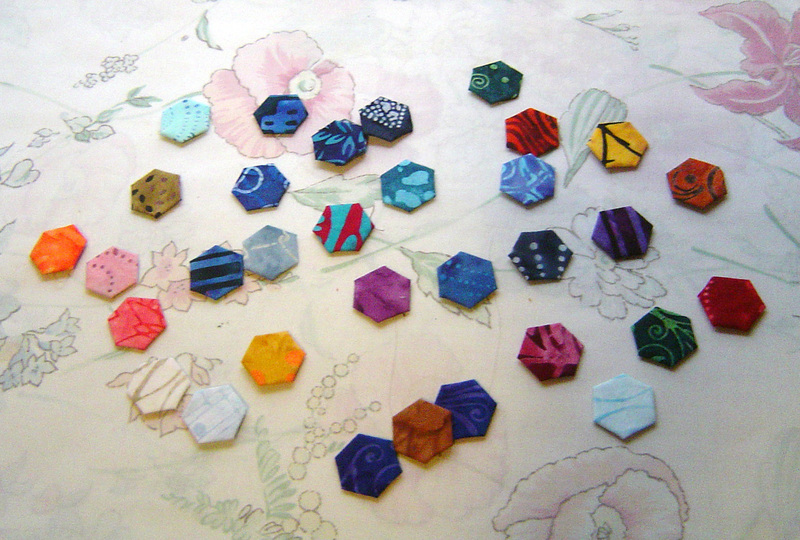 I have to go, but speaking of patience, persistence, and hexies. They’ve arrived. Here’s June 12, two weeks ago. see how they multiply when left to their own devices? The tribbles of the quilting world.